This is the third one that I've purchased. 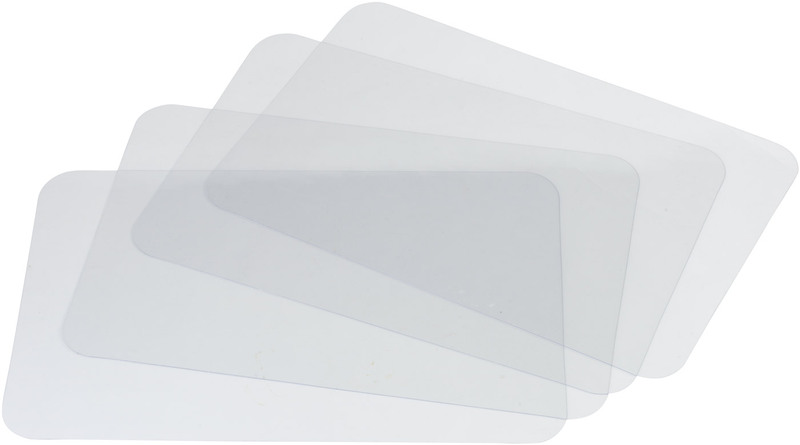 It's a wonderful table cloth and provides great protection for the everyday use of a glass-topped table. The elasticized edges allow it to fit perfectly, and it wipes clean in jiffy. quality is great. color is bright and brightens kitchen. Great size. Covers table over edges and hols secure..no slipping. I will by it again for sure. Easy to keep clean and looking good as new. Inside and patio tables,many times. Attractive and durable. I would buy this product again in other colors. Love this tablecloth. It fits my table perfectly . Will order another in a different color to change off. Would recommend it. 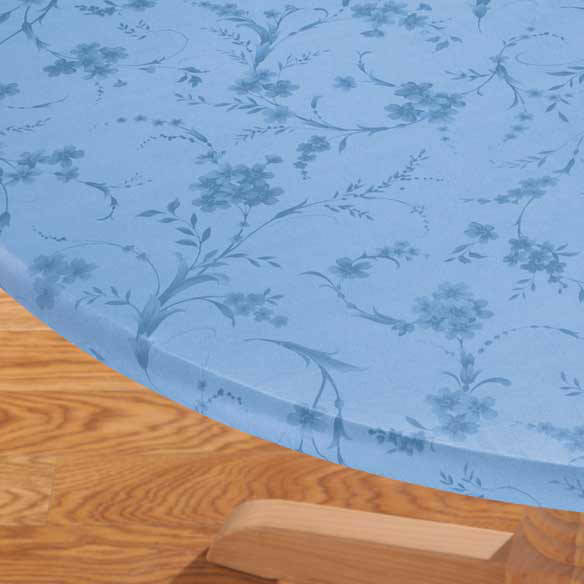 I love this table cover, it looks good, cleans easily, protects my wooden table, and it lasts. 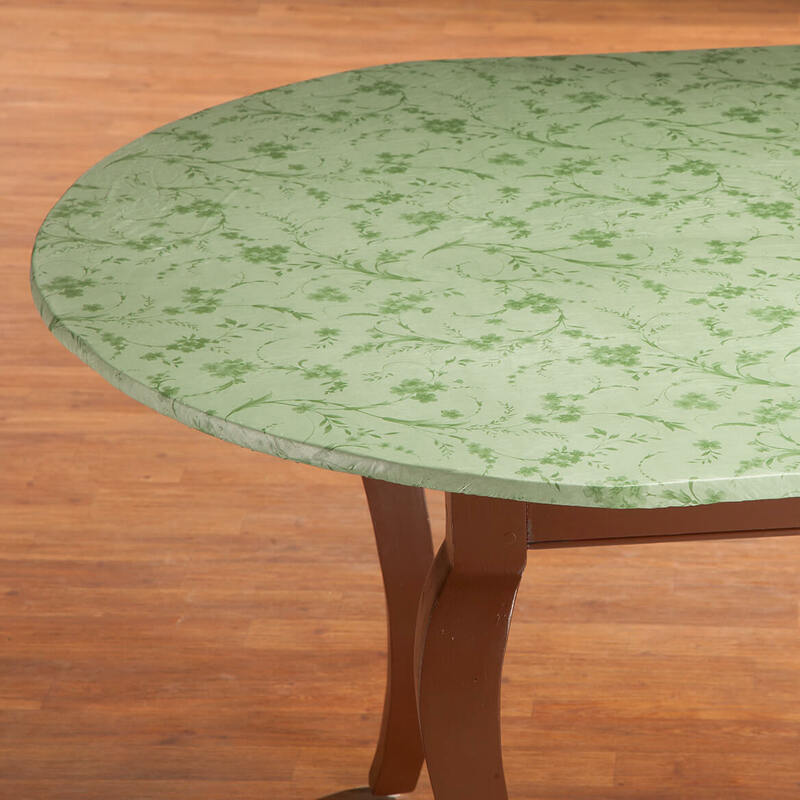 We have a small round table and it is hard to find tablecovers to fit it and this one fits like a glove. Great product great price. This table cloth is being used out doors and so far has held up very well to the inclement spring weather we have had. I purchased this for a friend to replace another one that had been cut...He likes it ..
As always great product. Love the way it covers the table and very durable. ttractive with many colors and patterns to pick from. I couldn't be happier. This is my third one i've ordered from you, and i love everyone of them, now i know there are some people that say things that are not so good about these tablecovers and all i have to say is, you can't please everyone all the time, there's just some folks you cannot please. That said, I'd like to thank you for these wonderful tablecovers, you make my day! I use them for different holidays to set off the flowers or whatever arangement i have on my table for the holiday, their very stylish.I use them when theres no holidays too. Again, Thank you so very much! 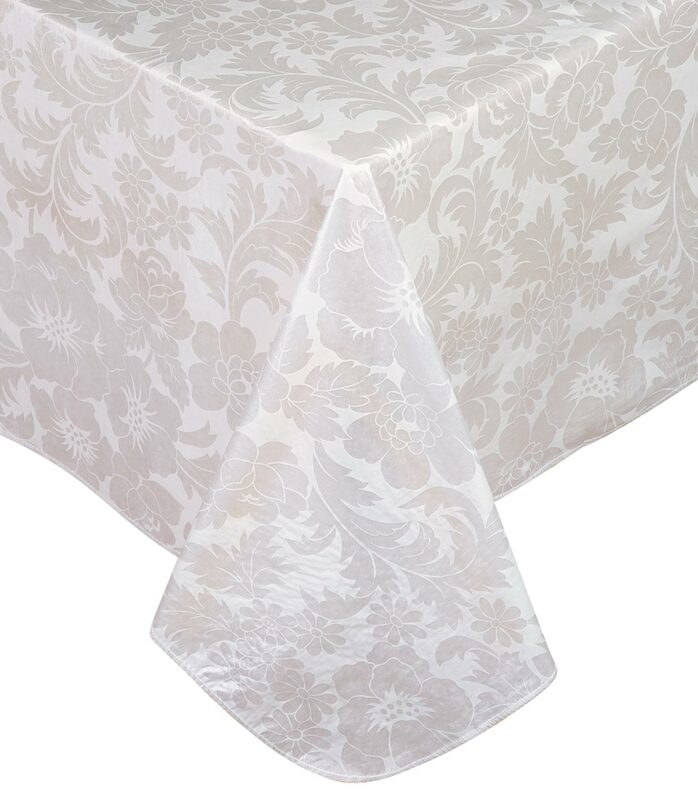 I have used these fitted tablecloths for many years on my kitchen table. Glad to see they are coming in more colors. This was a great idea, & looks lovely. Now, I don't have to worry about my granddaughter catching it, accidentally! Great is all I can say, I rate 10 stars, I ve ordered all patterns as long as its fitted, Thanks Miles Kimball!!!! I have not used it yet but Im sure I will like it. Perhaps could be a little heavier in thickness. Stays in place even when my grandchildren are playing games on it! Everyday on the kitchen table. Very Nice. Fits my table perfect! Wonderful table cover because I know it's going to fit just right. I have this on our kitchen table. I really like the fact that the table cover doesn't slip and slide like the other vinyl table cloth I had before. Our dogs would get under the table and consequently the table cloth would get dirty and have dog hair on the flannel part of the table cloth. No problems like that with this table cloth! The tablecloth fits like a glove! This tablecloth was purchased to help protect our new oak kitchen table. I chose the blue design to help accent my blue plaid kitchen curtains. The size fits the table perfectly! I love it!! Easy clean up!!! I love this product I use it everyday!! This is a very nice yellow color & pattern - we were surprised by the softness of the yellow - not a bright, ugly yellow. Of course, the elastic vinyl is very convenient & give a snug fit on the table. Most of all, the color is nice. I stopped buying the similar table clothes from the stores because they do not last. I had purchased some years ago and had not had to purchase until now. 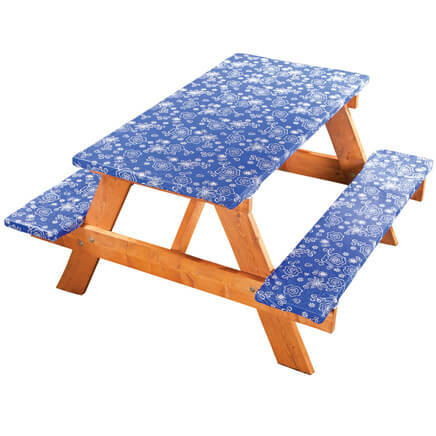 These table clothes are very durable and withstand all my kids throw at it. 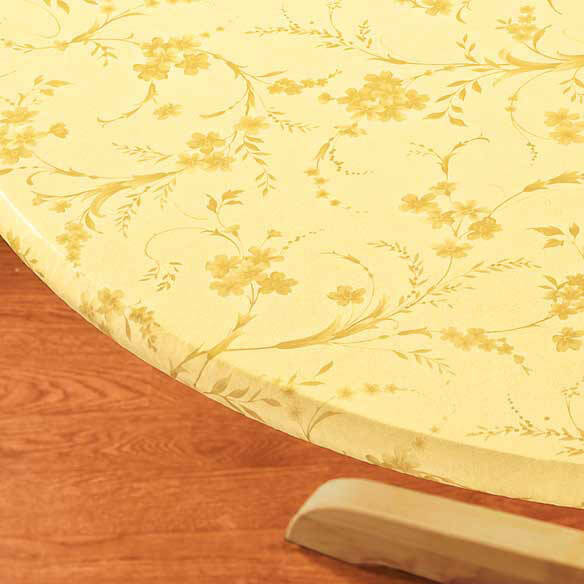 This tablecover is durable and won't be easily pulled off by kids or pets! It also fits my table perfectly. Best work saver, elasticezed table Cover. 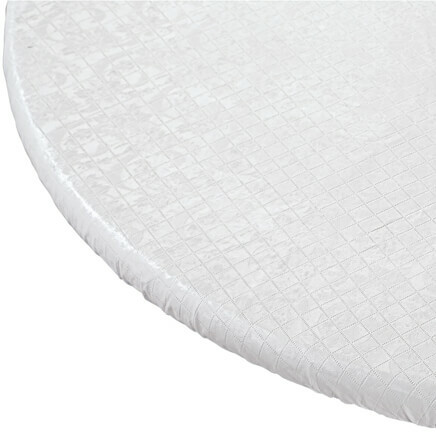 No more washing, stains, placing a pad under table cloth, or my kids pulling table covering off. It is in place, easy just wipe away syrup spills, and my card players love sliding cards smoothly without damaging my oak dining table. 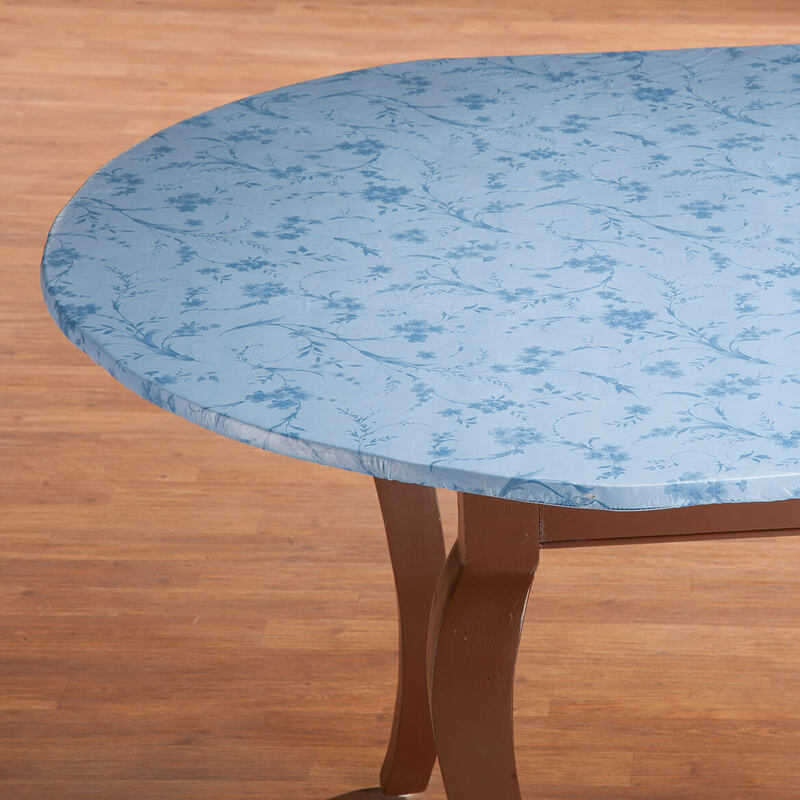 These elastized tablecovers are fantastic because they stay on the table and are great designs. I buy them for all my friends and family. I keep 3 in the house and change out with the seasons. The rinkles come out with just a few, less than 5, minutes in the dryer. It is so much easier to sit at the table without the table cloth hanging over and moving all over the place. Love them!! Affordable? Oh yes! Great tablecloth! Very easy to clean and very durable. It was just what I expected and thank you. It is nice that there are different sizes for the round table cloths as it is hard to find the right fit. I keep it on my kitchen table all the time. I buy one every year for my outdoor table. It stretches to fit perfectly and I love the pattern.The elastic does stretch over the winter months. The tablecloth is great because you don't have to worry about the table cloth sliding off the table. For a change I got something that was exactly what I wanted. This was not a high priced table cloth and you get what you pay for but it meets my needs perfectly. I just want to protect my table top from scratches and this does the job. It is a pretty green color that is nearly identical to the catalog. I have purchased this tablecloth in yellow many times. Love it. "AWESOME" just what we have been looking for. I love these! They protect my expensive dining tables! I am very pleased with my recent order of a fitted tablecloth. 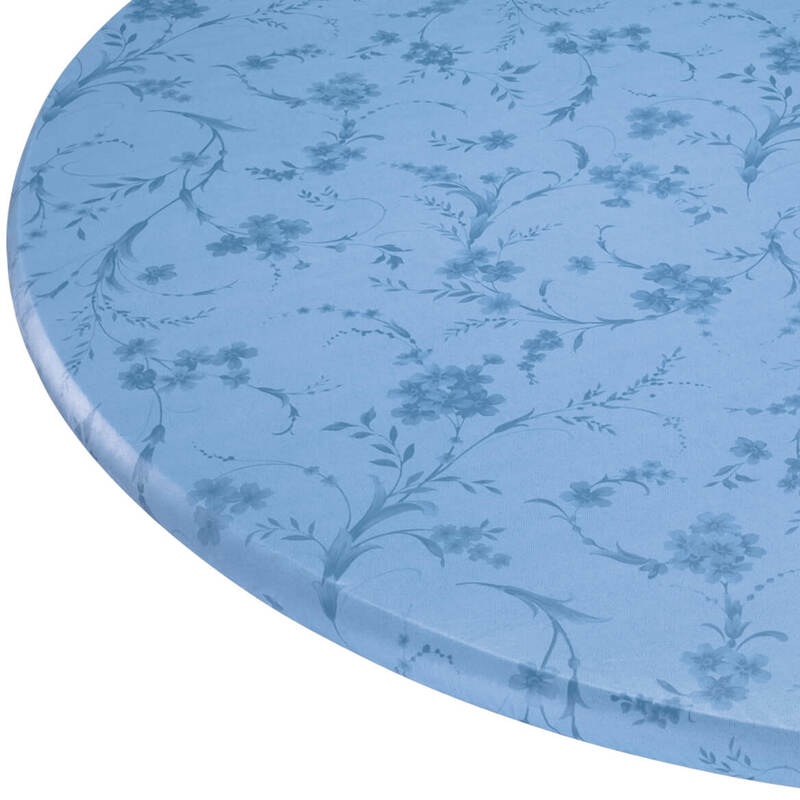 The color and the size is exactly what I was looking for, I just want to say "thank you"
This is the best round fitted table cover I found, tried a few other places and this one is the best. I ordered 4 in different colors and each one fits perfect. So far it is very good material. I like the fleece backing and the fact that the colors don't rub off, It is much heavier than the ones i've had before almost like going back in time when table cloths didn't wear out in a month's time. This was a great cover for a kitchen table, instead of using square placemats on a round table that never seemed to stay put. The elasticized cover looked neat and clean, and was attractive, too. I would buy this product again in a heartbeat! The tablecloth is being used for a black wrought iron round table located in our closed in porch. It is very attractive and give a nice appearance to the room. I would buy it again, perhaps in a different color. It's too new to try and clean using the washer/dryer and I really wouldn't want to take a chance. It cleans up easily with just a cloth. Great product. I have purchased this product before, gifts and for myself! Like the color of blue for this one. Had several of these over the years, fits my table perfectly. Can't find these in stores. I have three cats, when they jump on the table, the cover stays in place. I like the elasticized covers as they stay on the table nicely. I have ordered in the past this item each spring... It is always very good and works great on my table! We cover out tables at the Church for easy clean up. 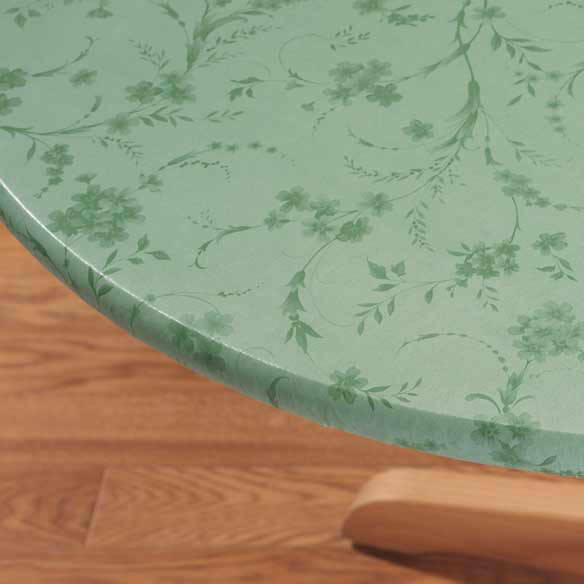 I have bought this type of round tablecloth for years to cover my glass tabletop. I love it. I have one and like it but after 5 years need new one. i love the different colors to change my kitchen i do wish they would have more colors to choose from. more Christmas table covers.. I like that kind of tablecloth on my table. love these, my kitchen table is in excellent shape and its been in my family since before I was born, but it looks nicer in my kitchen with colors and patterns on it. I always order these. I love these table cloths! They clean up so well and stay on tight! They fit perfect and stay on the table great and are so easy to clean.. I chose this item so that I will have two tablecloths instead of just the one. I have been using these for years. There isn’t anything better. Green looks good in my kitchen...also $3 off! Because I have one just like it. Like the elastic. Too much wind here. Bought this for my parents. They like to have their wooden kitchen table covered with an easy-to-clean tablecloth. They love it! I love the fit & choice of colors & patterns. You can't find these table cloths anywhere else that I know of. Because my cat keeps pulling cloth table covers off of the table. I needed an easy everyday table cover to protect my oak table. replacing a table cover that was torn after about 1000 uses (cover used for card playing to save scratching glass top). wanted color change, as well, and YELLOW is perfect for our new kitchen. 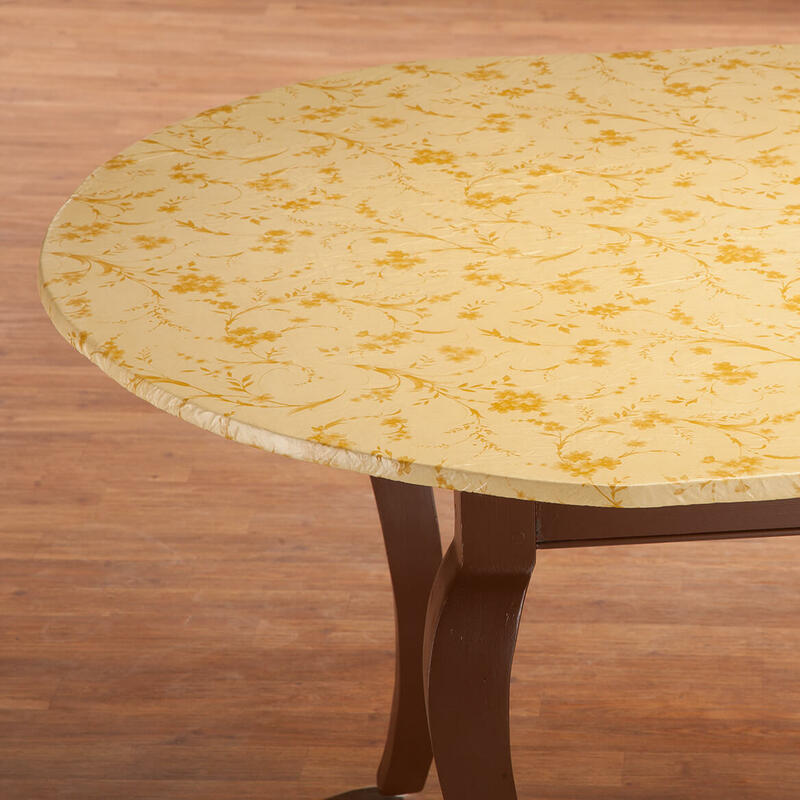 Fits my round table very nicely and I can choose the right color to match my kitchen. for a table that seats 4 I would normally buy a 70 inch round table cloth. Should I get the large round elastic? BEST ANSWER: Thank you for your question. 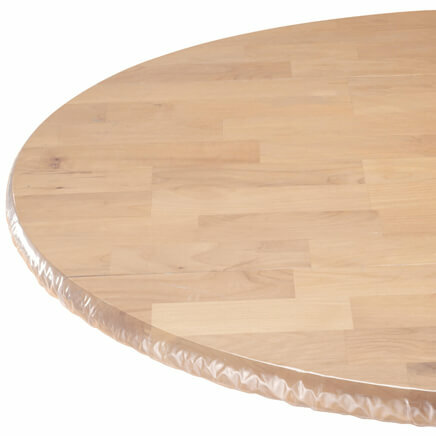 The large round table cover fits tables with a diameter between 45" - 56". We suggest measuring your table before ordering. We hope this information will be of help to you. BEST ANSWER: Thank you for your question. We only have the colors shown. We hope this information will be of help to you. Will this fit a 48" by 60" oval table? BEST ANSWER: Thank you for your question. Unfortunately no the 48" will not fit a 60" table. We hope this information will be of help to you. Where is my backorder tablecloth? BEST ANSWER: Thank you for your question. This item will be back in stock on 7/15/2016. We hope this information will be of help to you. My table. Size is 36wide and 66 long, rectangular...Will the 42 x68 Oval work and fit properly??? BEST ANSWER: Thank you for your question. The 42 x 68 will fit your table, the extra will gather underneath you table. We hope this information will be of help to you. IS THEIR ENOUGH GIVE TO FIT A 60" GLASS TABLE? BEST ANSWER: Thank you for your question. This table cover will not be big enough for your table. We apologize for any inconvenience this has caused. We hope this information will be of help to you. How do I measure for a round table? Do I measure it all around the table or across the table? BEST ANSWER: Thank you for your question. 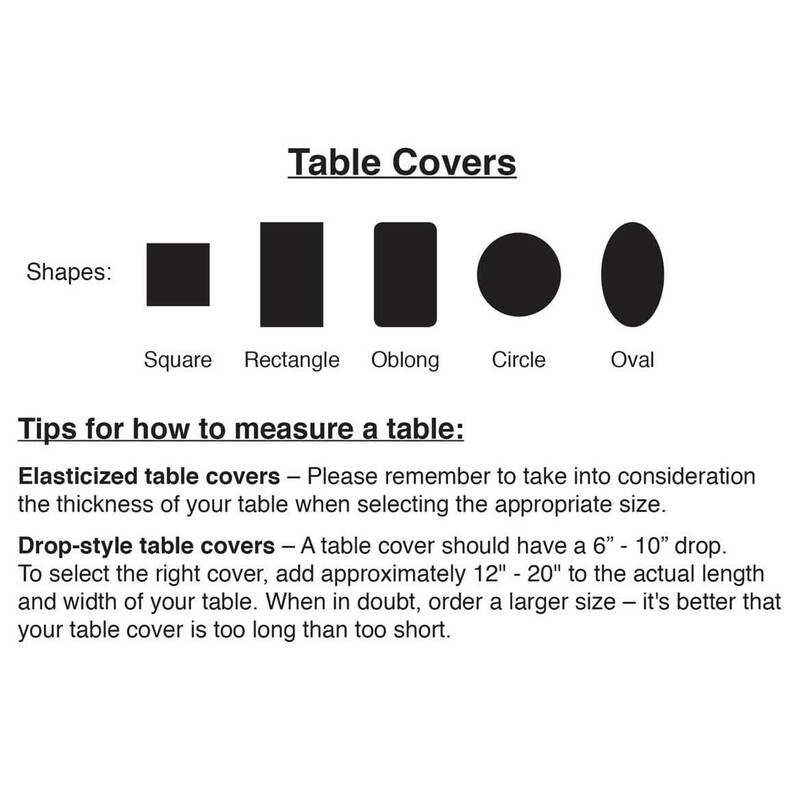 For a round table, you must measure the diameter of the table, straight across, to determine what table cover size will be right for you. We hope this information will be of help to you.